There are loads of different remote control cars for girls that make buying for a little girl very easy. Some girls love toy cars, ones similar to their old brother and won’t stop until they get one. For those special girls wanting to race their brother there is some awesome girly Pink RC cars that will make it a race to remember. We have chosen a range of cars here, suitable for girls as young as 1 to 2 years old. Some of the cars are more advanced, making them perfect for older children and young teens. Parents will love to get involved with races with their children – RC toys can be a great way for the whole family to spend quality time together. Durability – If buying for a younger child especially, you’ll want to make sure the car is really strong and durable. Toddlers drop things often, and those who have never had an RC toy before will be likely to crash a lot. Chose a strong plastic car with no flimsy or fine parts which could snap off easily. Battery Life – Your child will probably want to play with their new car as often as possible. Therefore, it’s a good idea to choose something with a longer battery life, or the kids will get impatient waiting for it. Batteries Included – Some cars comes with a battery which is rechargeable, whilst others require single-use batteries. Certain cars need several batteries at a time, so it’s a good idea to stock up, or get rechargeable batteries and a charger, so they won’t need replaced so often. WaterProof – Some kids will want to use their cars everywhere. If this sounds like your kids, it’s worth checking whether or not the car is waterproof. Some have strong tires are can drive well on most terrains, but they’re not always suitable for use in water. Dimensions – You may wish to choose a differently sized car depending on the age of the child you are buying for. Bigger, robust cars can sometimes be better for younger kids as they can be easier to control and less breakable. Also check your child’s toys will fit inside if buying a car which can carry dolls or figures. Ease of Use – All the cars we have reviewed here are ready-to-use for the sake of simplicity. This means they just need batteries, or to be charged, and will be ready to play with straight from the box. This pink radio controlled car is ideal for younger girls who enjoy racing their girly car around the house. It comes with a cute, removable Hello Kitty figure for even more options for play. The car plays sweet sound effects sure to be loved by toddlers. It travels slow enough that it’s easy for younger kids to keep control of. Also, there are only two buttons, one for forwards and one to reverse and turn. This means it’s really easy to learn how to drive, making it the perfect first RC car. This yellow car is perfect for older girls who are looking for a faster RC toy. It can reach a top speed of 10 mph, and the remote has a range of 30′, making it ideal for outdoor use. The car does not come with any batteries, so you’ll need to stock up on AA for the car, and a 9V for the controller. The car only operates on one frequency, so if you plan to race it against another radio-controlled vehicle, you’ll need to make sure their frequencies are different. 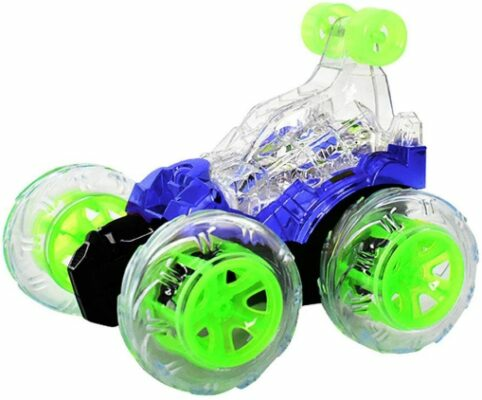 The race car toy is ideal for children over the age of 6 years old. It is more robust than it looks, meaning it can be safely used by beginners! Older children will love the realistic details inside the car, and it even has working headlights and tail lights to add to the fun. This stylish RC car comes in a unique purple color perfect for little girls. It features LED headlights for night racing, and can travel in all directions. There is a control on the car which can be used to alter the turning circle, depending on where it is being driven. The purple girls remote control car is small and compact, making it easier for younger children to hold. The 1:16 scale is a great size for children – the car is just over 10 inches long. It’s also worth investing in some rechargeable batteries for this car – 6 AA are required for the car and remote. This is a great first RC toy for young girls. It can go forwards as well as reverse and spin – perfect for toddlers who don’t need loads of fancy features. The car is designed for indoor use, and works best on hard floors. The RC vehicle is ideal for toddlers aged around 18 months old and above. It only has one frequency, so ensure it won’t interfere with other radio-controlled toys that you already own. The car is perfect for little ones thanks to its durability. The strong, tough plastic can handle being bumped and crashed by learner drivers without getting damaged! This girly RC car is perfect for any Barbie fan. The car fits any regular Barbie doll, so little girls can choose who to take for a ride. The car is a great size at 17 inches long, and is really sturdy too. The pistol-style remote is easy to use. The car can travel in all directions – forwards and backwards as well as left and right. Girls aged around 5 years old and above will love this RC car. It requires 5 AA batteries at a time, so it’s a good idea to get rechargeable ones otherwise they’ll add up quickly. Overall, the car would make a great addition to any young girl’s Barbie collection! This girls pink remote control car is perfect for fans of Lalaloopsy – it can seat up to 2 of the dolls! This is great for giving your little girl new ways to play with her dolls, creating all sorts of different scenarios for them. The car is available in both pink and purple, and comes in the typical Lalaloopsy styling. The top of the car can be removed to make getting the dolls in and out a bit easier. The car is also just the right size to fit Barbie and her friends, so any of your girl’s dolls can take a ride. There are even little seatbelts to keep the dolls safe during the journey! This Pink RC stunt car is perfect for children aged 4 years old and above. It has cool LED lights and plays music when driving, making it great for using in the dark! It can travel in all directions, including rotating 360 degrees. Older kids will love to show off their stunts to their friends – the car can do epic wheelies and has extra wheels to help with balance. The car is extremely strong and durable, meaning it can be used just about anywhere, and by kids of all ages with no damage. The car comes with a rechargeable battery, meaning it won’t cost a fortune to run! This is a great toy to keep kids, and even parents, entertained over and over again. This official licensed Mustang toy is perfect for girls who love to race. It comes with a sticker sheet, allowing girls to create their dream car! The car can be used indoors and outdoors. It operates on a 27MHz frequency, so make sure it won’t cause interference with any other RC toys in the house. The car has a good top speed, and is easy to control. This makes it perfect for girls of any age. The car doesn’t include a built-in battery, so you’ll need to provide some AA batteries. However, they last well and won’t need changed too often. 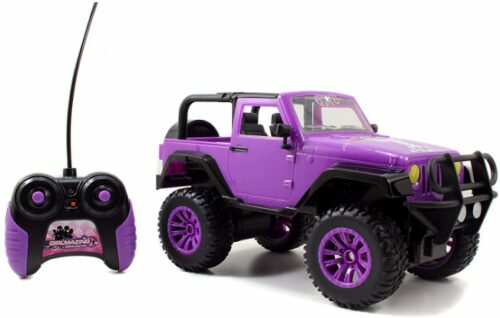 This Jada purple barbie remote control Jeep is perfect for girls aged 6 years old and above. It can take 2 standard sized Barbie dolls, and any other 10″ doll. The car even comes with stickers, allowing girls to customize it in any way they choose. The stylish vehicle is licensed by Jeep, and has the features you would expect including a spare tire and a cargo area at the rear. It has large, off-road tires which are perfect for outdoor use. The car handles well on any terrain, including grass and dirt. The radio-controlled Jeep comes in a 1:16 scale, meaning it is just under 1′ long. Our favorite RC for younger girls is the Pink Barbie Convertible Remote Control Car. It is great for imaginative play, as girls can take 2 of their favorite dolls for a ride. The car also looks great, with signature decorations. The vehicle makes a great addition to any little girl’s collection of toys – it’s the same scale to work with the dolls and playsets. 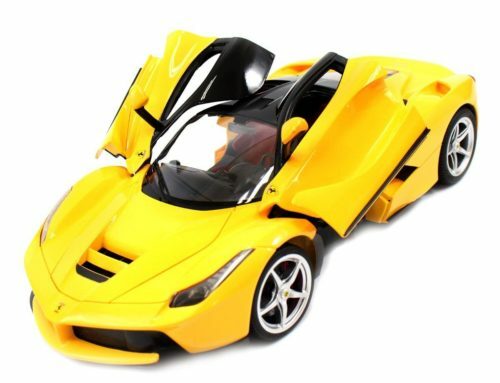 For RC fun at a lower price, the yellow Ferrari makes a great choice. It is officially licensed and has good looks – sure to be loved by girls of all ages. This car has great features for the price point – including suspension and LED headlights. Little girls will love racing their older brothers with a car like this! Starwalkkids.com is a participant in the Amazon Services LLC Associates Program, an affiliate advertising program designed to provide a means for sites to earn advertising fees by advertising and linking to Amazon.com, Amazon.co.uk, Amazon.ca.